This got reported as Bug 346857 and was nothing new to us: we have had similar problems before, which makes it a little bit sad. The problem here is that glxgears doesn’t speak the close window protocol. Normally when you click the close button the window isn’t closed directly, but the window gets notified “please close your window”. So the mechanism is asynchronous. This also explains why such an issue has not been detected during the testing: it’s not happening with default decoration and it’s not happening with “normal” applications. It can only be reproduced with applications which do not behave correctly. Now in order to never have that happen again I created a test application and reported a bugreport against Qt. And of course we worked around the problem by delaying the handling of the close to the next event cycle. Now you might wonder how it’s possible that we allowed such a regression to sneak in again given that we had seen it before? Well that’s easily explained, up until recently we were not able to run full tests against KWin. We might have been able to unit test this area, but it would have passed, this issue needed an integration test. And that’s what I added now, so that we won’t hit it ever again. It’s probably the weirdest auto test I have ever written, involving starting glxgears (thanks to our sysadmins for installing it for this test case! ), simulating the mouse click on the close button and ensuring glxgears closes without crashing KWin. The second crash I run into directly after investigating the first one. I wanted to switch back to Breeze decoration but couldn’t because the config module crashed directly. This was bug 344278 – a really nasty one with 74 duplicates. We had wonderful crash traces, but missed the important part about how to reproduce it. From the crash trace alone we were not able to figure out what’s going on. Well we saw some aspects but it wasn’t enough to properly investigate. 3. Select a theme which name’s first latter is far away from “B”, e.g. Plastik. And boom! What happens is that we load all decorations and put them into a ListView, then we select the theme the user is currently using and ensure it’s centered in the list view. This results in the list view scrolling. ListView has a cache of elements and if you have too many it will throw out other elements. So our Breeze deco which gets created at the start (early in alphabet, will be shown) is kicked out again when selecting Plastik if there are too many decorations. This is the requirement to have many themes installed and also to select one far down in the alphabet. With anything else you won’t trigger it. The bug itself got triggered through Breeze decoration because there is a Property animation running which triggers another update on the decoration after it has been kicked out. It accesses a member which got destroyed by the QtQuick engine. All of that also means that the crash would not have been triggered if that code would have been e.g. in Oxygen and not in Breeze. Because then it would not have hit. Also just scrolling in the list after it loaded even if you have many installed, won’t trigger the crash, because then the animation is no longer running. It’s only running after loading in the preview. What I want to show here is that this is an extremely hidden corner case to find. You must have exactly the same conditions to trigger it. Given that I’m also surprised that we have so many duplicates for the report. So how to fix it? Obvious idea: one could disable the anyway not visible animation in Breeze. But that’s not a fix, that’s just a workaround and doesn’t solve the actual problem. Other decorations might trigger that again. So we need to understand what’s going on. What we knew is that the Decoration triggers an update and crashes because the DecorationBridge is no longer valid. But that’s impossible! The contract of the KDecoration API is that the DecorationBridge will always be valid if there’s a Decoration. So how could the contract break? For this we need to look into how the QtQuick code for rendering the previews works. Each Decoration is wrapped by a PreviewItem and each decoration gets it’s own DecorationBridge provided by a PreviewBridge. The PreviewBridge is directly constructed through QtQuick, the Decoration is loaded later on. What is now interesting is the tear down. When the PreviewItem gets destroyed by QtQuick it doesn’t delete the Decoration directly, but delays it to the next event cycle. So the Decoration outlives the QtQuick items. When the PreviewItem gets destroyed by QtQuick also the PreviewBridge gets destroyed by QtQuick and thus we have a Decoration which is still alive, but the PreviewBridge isn’t. Why was it done that way? Well to prevent crashers caused by QtQuick. So our workaround for a crash just introduced a new one. Meh. The solution now is to also delay the deconstruction of the PreviewBridge to the next event cycle. I hope this does not again create a new crash. The interesting part here is that it’s completely inside Qt. We come from the event loop and an event is handled inside Qt and crashes. No code of the control module is executed in this trace any more. QSG_RENDER_LOOP=threaded systemsettings5 and follow the reproduction steps and boom! Yay, I have a test case. Following the old saying: “consider a bug fixed when a developer is able to reproduce” the hardest way was solved. So I started investigating. Let’s try with kcmshell5 instead of systemsettings. Hmm doesn’t crash. Let’s try with kscreen’s test application instead of systemsettings. Hmm, doesn’t crash. So something in systemsettings must trigger it! And I started reading code and read and read, tried here something, tried there something and come to the conclusion: systemsettings is not doing anything wrong. QSGDefaultLayer::bind: ShaderEffectSource: ‘recursive’ must be set to true when rendering recursively. So obviously I set this missing recursive on the OpacityMask. Hmm, compile error, that doesn’t exist. So let’s make it non recursive and there we go, it doesn’t crash any more. I would love to report this to Qt, but so far I failed with creating a simple test case. Just like with my testing with kcmshell5 and the kscreen test application I’m not able to hit the condition and I haven’t figured out yet what is different in systemsettings. Like in the previous example it’s a crash deep down in Qt. The first code related to code we distribute is at stack position 55. So again I needed to experiment to figure out the minimal code which triggers the crash and after some trials I figured out what causes it: setting root context properties. After reworking this to no longer needing a context property, it doesn’t crash any more. Again this should be reported to Qt, bug so far I failed to create a simple example demonstrating the problem Of course setting a root context property works in my examples. If one of my readers have an idea what’s so special about systemsettings to trigger it, please let me know so that I can report bugs against Qt. As we can see with these four cases: we are hit by issues further down in the stack. We can work around them, but this comes with a cost as it doesn’t fix the actual problem. Some of the problems are real corner cases, hardware dependent and cannot be reproduced by all developers. Last week we got quite some criticism about the quality of KDE Plasma 5 on the Internet. This came rather surprising for us and is at least in my opinion highly undeserved. 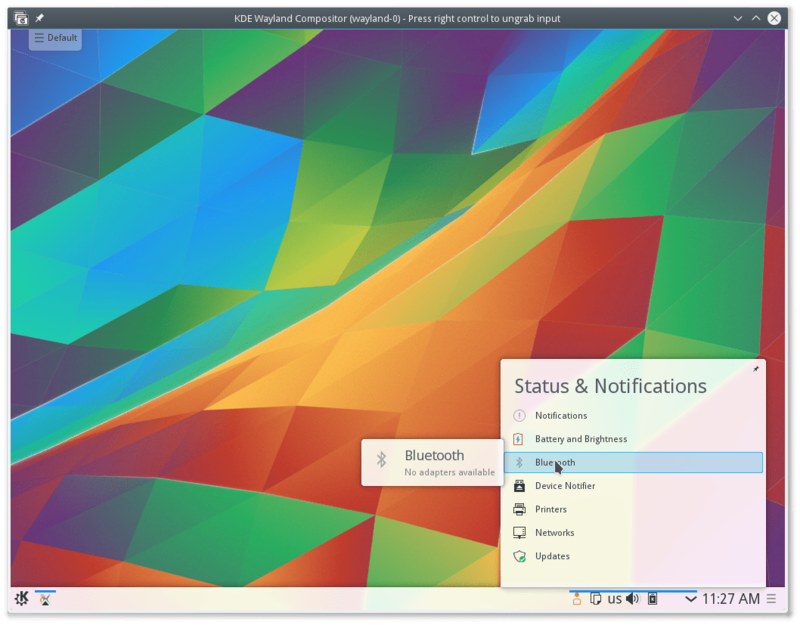 So far what we saw is that Plasma has a high quality – probably better than previous iterations of what was known as the KDE Desktop Environment – and got lots of praise for the state it is in. So how come that there is such a discrepancy between what we see and what our users see? Plasma is just one piece of the user experience our users get. It’s the most visible one and it’s also the one which gets all the blame if things break. But in reality there is much more to it. Plasma depends on other libraries – most importantly Qt – and on drivers (OpenGL/Mesa) and on hardware. All of that is put together by distributions. We don’t ship the software to our users, we ship it to the distributions which then integrate it with the rest of the stack. All we can do is give recommendations to our distributions about common issues and how to prevent that they happen. Now I don’t want to move the blame to the distributions, because that would also be undeserved. I just want to explain how complex the process is. So let’s start with a look at some numbers. I’m looking at a combination of the applications plasmashell, kwin, krunner and systemsettings. These are the most visible to the users. The numbers will be slightly distorted, because there were also bugs going in for the old 4.11 series and only plasmashell is a 5 only product. Over the last 365 days 1313 crash reports were reported for these products. That’s quite a number, but means it’s only about 3.5 per day. Given our large user bases that’s not that bad. If we had a huge quality problem we would get hundreds of bug reports per day. And yes we do, I had been in such situations in KWin that we got two digits numbers of duplicates per day. Of those 1313 crash reports 127 are still unconfirmed (we need to improve here!) and 23 confirmed. The number looks high, but now we need to look at how they distribute. There are a few bugs with a high number of duplicates. Given my limited search skills I found one with 91 duplicates which got a fix released six months ago, but we still see new duplicates for it. I come back to how that happens later. A few bugs reported several times and we get close to the numbers. I just summed up the number of the ten most often reported crashers and that’s already about half of the reported crashes. So why are there crashes reported so often and are not immediately fixed? This is exactly the weakest link I have been talking about. It’s things we don’t have an influence on. One of the most severe issues we hit with Plasma 5 is an issue with the Intel graphics drivers. I think that this problem is the reason why people complain about instability of Plasma. The only reason. Crashes in drivers (especially Intel) are nothing new, it’s a problem which has haunted us for years. For example the most often reported crash against KWin is a crash in the Intel driver – we worked around that issue by disabling a feature for all Intel users and will never ever enable it again. Now I know that this sounds like passing the blame to the graphics drivers and I can imagine that you say that we need to QA test. That is true, we need to QA test, also against the drivers. Just that’s not possible. I blogged about why that’s not possible back in 2011. Nothing has changed except that the number of possible hardware and driver combinations further increased. The biggest problem for us is that the drivers a distro will ship doesn’t exist yet when we develop and test our software. Even if we would use development drivers it would be too old compared to what distros ship. One could say it’s the responsibility of the distribution to do the QA. Yes, they as a software integrator should make sure that the software works together. And they do, but lots of it runs in VMs which don’t provide the “real” hardware. But expecting distributions to do all the combinations we cannot test, is also wrong. If there is one which can do the quality assurance of e.g. the Intel driver it’s Intel. They have the hardware, they have the developers (AFAIK there are more fulltime devs working on the Intel drivers than we have devs on Plasma), they have the QA team. I do not know how they test, but I am sure they could spot such severe driver regressions. What to do when we hit such a severe driver issue? Well that’s difficult. If possible we can workaround like the KWin problem I mentioned above. But that still takes time till it reaches the users. In this particular case we informed distributions about a possible workaround on Xserver level and I hope ll distributions applied it. If not please complain to your distribution. Another source of reported instability is multi screen handling on X11. Again the problem does not lie on our side but in this case Qt. First a word of clarification: auto-testing multi-screen on X11 is extremely difficult. Virtual X servers like Xvfb do not support the randr extension which makes it impossible to mock a correct behavior in X. Also testing with real X doesn’t help as that can only test with the screens one has and physically plugging out a screen during an auto-test isn’t really a solution. So this sounds like blaming Qt, which of course is not what I want to do. You can rightly question why we as KDE do not help Qt with it. Well we did. Especially Dan Vratil did an incredible job of improving the experience directly in Qt. There were things which one wouldn’t believe are possible. For example there is an xrandr call to read the configuration and that blocks the Xserver in the Intel driver. Now each Qt application did that and caused a freeze. When I figured out the root source for this problem I created a remote denial of service proof of concept against X server and informed the security list about this problem. I did this in January and haven’t got a reply till now and have not talked in public about this. So yeah I just did a full-disclosure. Anyway Dan worked around this problem and fixed many more. So why is this all still an issue? This is slightly related to how Qt and Plasma releases are not synced. For example at the moment Qt 5.5 will not receive any bug fix releases any more, but all we have in distributions is Qt 5.4. This means any fixes we do will not reach users till distributions roll out Qt 5.6. It’s rather depressive to be honest. You know you fixed an issue, but it doesn’t reach your users. I think this needs works from both Qt and the distributions. We need more bug fix releases and distributions must update Qt more often. I hope that the long term release Qt 5.6 will improve the situation as that gives us also a chance to provide bug fixes and hopefully reach our users. As it stands there seem to still be crash cases in Qt 5.6. Since recently I have a nice tool which should allow to mock multi screen setup and I want to try to dedicate some time this week to create test cases. If that works I hope we can move this forward. Another problem we noticed is that fixes we created doesn’t reach our users. This is mostly to how some distributions work with the exception of rolling release distributions. They create a “stable” and “feature frozen” product. If a major version number increases it’s not going to be updated. I just described the problem with outdated Qt, that’s part of the story. The update didn’t get into the distribution and thus fixes don’t reach our users. Even more with frameworks we don’t provide bug fix releases and that creates “problems” for distributions. They don’t roll our the new frameworks, although they fix important issues. This is slowly improving, distributions need to get used to this process and also accept that their policy doesn’t apply. Furthermore one needs to point out that some distributions do have additional repositories to get newer software. If you use e.g. Kubuntu 15.04 I highly recommend to use that. Every non LTS release from Ubuntu is basically a testing distribution. If you use that you decided to go with faster software updates. Please use the ways to get those updates. If you don’t want that please stay with LTS. This is something which applies to pretty much all distributions. Stay with the long term releases if you don’t want to update to newer software. What we also heard a lot lately are complains about that we removed features. Yes we did that, we streamlined some implementations, we decided to focus on the core, we decided to not port all X11 specific code, but allow 3rd party applications to fill that niche (e.g. SDDM or LightDM instead of KDM). Nevertheless let’s look at some of the complains. The biggest problem for our users seems to be the removal of support of the legacy system tray (xembed). This was not a move against our users, but a change we did not expect to cause so many problems. We did evaluate the situation prior to the release and saw that it was possible to do this step without loss of functionality. Nevertheless it created problems. How was that possible? A key feature to the switch was getting the distributions in. Our distributions had to patch software in the same way as Ubuntu did. So we collected the required changes and informed distributions about it. The patches to Qt 4, which flags to enable in which repositories and so on. With some distributions that worked awesomely, with some we had problems. In one distributions the GNOME maintainers refused to enable the required flags (boo), one distribution decided to not enable the Qt 4 patch because that’s not what they do, but they already had patches for arm64 (WTF? Support for a theoretical architecture is more important than users on existing hardware? Wtf, wtf!) If your distribution did not do the transition in a sufficient way, please complain to them and not to us. Now there were things which got overlooked. Skype needed proper multi-arch and the package installation did not always work. Distros were informed about this problem once we noticed. Some proprietary applications used static linking destroying the “magic”. That’s unfortunate, but also not our fault. And also in the area of proprietary applications: wine applications have no fallback. Sorry about that, but we just were not aware of that and we didn’t get a feedback quickly enough. We noticed that this is a problem and David started to work on a solution for Plasma 5.5. I’m not happy that we had to do that as it just delays solving the actual problem: we need to get rid of the old systray. I’m already seeing the bug reports about unusable systray icons on HighDPI or not working on Wayland. There is also one solution: work together to get this transition done. Bug your distributions to include all patches (if not done yet), bug your favorite projects to port. It’s about time! Some of the feedback we got is that users are unhappy that they cannot have different applets and wallpaper per virtual desktop and also on dashboard. Yes we understand that this is seen as a regression, so let’s look at why we changed. First of all: change is sometimes required also removing features is sometimes required. We are sorry for the users affected by such changes, but we normally don’t do that without good reason. We are extremely careful as you can see in the systray case where we coordinated with distributions months prior to the release to make the transition smooth. For the features here in question we need to look back at the last iteration of Plasma. Some of the things we learned was that these features just didn’t really work, they were buggy and there were many conditions were it just didn’t really work. An example is KWin which just never really knew when Plasma is in dashboard mode, we failed to properly set up the state and it just resulted in lots of quirks. So when we looked at it for Plasma 5 we realized that it’s extremely close to another mode KWin could handle well: Show Desktop. So we merged those two and improved the Show Desktop experience at the same time. Multiple virtual desktops in Plasma had always been a quirk. I remember one discussion shortly after starting to contribute to Plasma: we were not able to properly support this feature in Desktop Grid or Desktop Cube. Technically that was just impossible how Plasma worked. We were not able to solve this problem in all of Plasma 4 and we would not be able to solve it in Plasma 5. In addition it also caused problems with various other features, so overall it looked like a better idea to disable this feature in core Plasma. This goes along with the fact that we consider Virtual Desktops as a high productivity and experienced user feature. By default they are disabled. Now we understand that this is a feature important to some users. But we need to ask you to understand that we cannot maintain all possible features for all possible users and that sometimes the quality of the complete product is more important. Furthermore Plasma is a flexible product and it should be possible to provide this as a 3rd party feature. There are a few more features which just didn’t make it to the new release. In many cases that’s because of the features do not have a maintainer. Examples for this are KHotkeys and the application menu. In both cases the port was not trivial due to changes in the underlying infrastructure, so we couldn’t manage it with our limited resources. But that’s of course a chance for you, dear reader. If you are a developer and loved some of the features we were not able to provide, you can step up and maintain them. We are always looking for more help! What was important to us is to not overload ourselves with more code than we can maintain. We want to provide a high quality product which we can ensure that it is high quality. This required to cut down in some areas. I think that was the correct decision and I think we reached our goal in providing a foundation for a high quality product. Overall with our new product we put a focus on quality and adjusted our workflows to ensure that we have a high quality. As already mentioned we decided to focus on the core and by that focus only on what we can ensure to maintain. That’s just one aspect to it. Another aspect is the increased usage of automatic testing thanks to continuous integration done directly by KDE and also by our distributions. A big thanks to openSUSE for openQA and Kubuntu for the Kubuntu CI! Those two instances have caught many issues which slipped through our CI. Additionally we release in shorter cycles (frameworks each month, Plasma every three months). This is only possible by ensuring quality through higher code review, requirements for auto tests, etc. A good overview can be found in sebas’s blog post on the topic. The bugs are so obvious that I’m sure they are all reported. Don’t ever do that. If you think they are obvious that implies that also the devs see them. If the bugs are embarrassing to look at (like in this blog post mentioned not updating digital clock) you can be quite certain that the devs haven’t seen them. We use the system as well and come on if the clock doesn’t update we would notice. This implies now that the “obvious” bugs are not “obvious”. The devs are not seeing them. Thus report them! Even those which are so clear to see that you ask yourself what the KDE devs have done to release software in that quality. Report your bugs, all of them. They are not obvious. 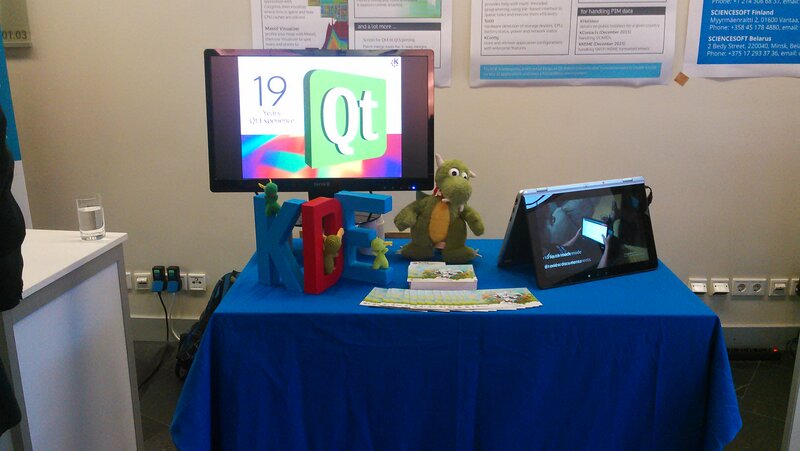 Last week I attended QtWorldSummit in Berlin to help represent KDE manning the booth and chairing some sessions. I want to thank KDE e.V. for the support to go to this great event. It is awesome to see such a huge and vibrant Qt community and to see KDE as an important part. So many talks and also keynotes have speakers with a KDE background. At our booth we had a clear focus on the frameworks – understandable given that it’s what is most interesting to Qt developers. But of course also many guests also asked us about other applications and Plasma. What was clearly visible at the conference was that many booths had their demo run on Plasma powered systems and in many cases it was already a Plasma 5. From the talks I attended I noticed that Wayland is a really big thing in the Qt community. Be it smart TVs or in car entertainment systems or even the driver’s dashboard: they run Wayland and use the QtCompositor API for it. This is quite exciting to see that QtCompositor seems to be a great fit for such use cases (while it isn’t for KWin). What’s even more exciting is to learn that such systems work without having to fall back to Android drivers and solutions like libybris. For the ecosystem this is great to see: Wayland is entering the embedded world and it’s Qt which is used for it. I haven’t seen anyone talking about using X11, Android or Mir for these cases which gives us a very strong and united ecosystem. Very exiting times are in front of us with lots of opportunities also for KDE as if QtCompositor isn’t sufficient we can jump in with either KWayland or even KWin. September was a busy months in the KDE Wayland world. We have worked hard to bring Plasma closer to a workable system and could cross off some very important milestones. One of the biggest oddities when trying out Plasma on Wayland in the 5.4 release is the fact that menus open at random positions. The reason for this is that KWin applied it’s placing strategy on it and ignored the hints provided by the window. We have now implemented support for the so-called transient windows in KWayland and use the provided placement hint in KWayland. So now all menus open at the correct position. A useable Wayland session is much closer now. Marco did quite some work for the integration of Plasma. KWin provides some Plasma specific extensions like the sliding popups effect, blur and background contrast effect, etc. We have an abstraction through KWindowSystem so that applications do not have to use low level X11 calls directly. Now we extended this abstraction to also Wayland: if the application uses the API it will work on both X11 and Wayland. Granted it will only work with compositors providing the specific protocols, but that is no difference to X11. Also there the compositor needs to implement the custom protocol. a plugin provided by the kwayland-integration repository. On KWin side the protocol is also provided in KWayland allowing a very easy to use API. Of course also KWin needed small adjustments in the effects to announce support for the protocol and read the information provided by the windows. Thanks to nice wrapping in KWayland the code is cleaner and simpler than in the X11 case. A change not directly relevant for KWin went into KWindowSystem and will be released with the upcoming 5.15 KDE Frameworks release. KWindowSystem provides an X11 API which looks like it supports multiple X Servers (e.g. one application talking to multiple servers), but that has never worked as it fetched required atoms only on first connection. We refactored the relevant code to no longer have this limitation. Granted normally applications do not talk to multiple X servers, but there is a mode in KWin which uses just that: a nested kwin_wayland on X11. To explain: it needs to talk to the host X server for rendering two (one server) and it starts it’s own Xwayland server (second server). In case you have ever wondered why the nested kwin_wayland window released with Plasma 5.4 neither has a window icon nor a window title: that’s the reason. We couldn’t use Qt’s abstraction (wrong QPA plugin) and also not KWindowSystem as we needed to make sure the atoms get resolved for the Xwayland server. Now with this restriction removed the window has an icon and a title. Even more I added a “grab input mode” as one might know from virtual machines. While it’s easy to implement I didn’t want to implement it without having a way to tell the user what happened and what the current grab state is. The most exiting new feature in my opinion was born last Friday based on frustrations about testing KWin Wayland. Last week Marco and I spent quite some time investigating a few regressions (as it turned out due to adding transient window support). The way to test it was just uncomfortable. We had a test case but it meant starting KWin, waiting till it’s started, start the test application, perform some clicks and interpret whether it worked. Once we fixed that issue I started to look at a crash and the process was similar annoying. What I wanted was a way to automate the test condition, that is an autotest which we could even run in our CI system. So on Friday I decided to dedicate my development time on a virtual framebuffer backend.This backend (to start use kwin_wayland --xwayland --virtual) doesn’t render to any device, but only “simulates” rendering by using a QImage which then isn’t used at all. Well not completely true: there is an environment variable to force the backend to store each rendered frame into a temporary directory. Why is such a virtual backend so exiting? Well it means we can run KWin anywhere. We are not bound to any hardware restrictions like screen attached or screen resolution. With other words we can run it on servers – in the cloud. The first such instance runs on our CI servers in the form of an automated integration test. And in future there will be much more such tests. But that is not only interesting for KWin to have it’s autotests, it’s also interesting for all other projects of the workspace as we have now a virtual Wayland server which is functional identical to the one we use. We also have a better virtual X server now as we have Xwayland instead of Xvfb (e.g. support for XRandR extension). Once I had it implemented ideas came to me for improving our CI system: we could use it for something like OpenQA (or integrate the existing tool) and start a complete Plasma session and screenshot various points (if that sounds like an exiting project: please contact me, also if you want to do that as a Season of KDE project ). Or integrate a remote rendering solution (e.g. VNC, rdesktop, spice, html5) and run a complete session through the web. That could be a very interesting feature for designers, translators, supporters and many other non-developers. Get the latest state of the code directly tested. We have things like Kubuntu CI which make it easy to test in a virtual machine, but wouldn’t it be even more awesome to just run the latest build of the CI system in the browser? With the help of this virtual backend we are now able to start a “complete” KWin in the autotests. This allows us to very precisely test whether a specif feature works as expected. Unit tests are great, but sometimes one wants to test the complete integration and that’s now possible. The first problem addressed with this new possibility was a bug noticed while writing this blog post. 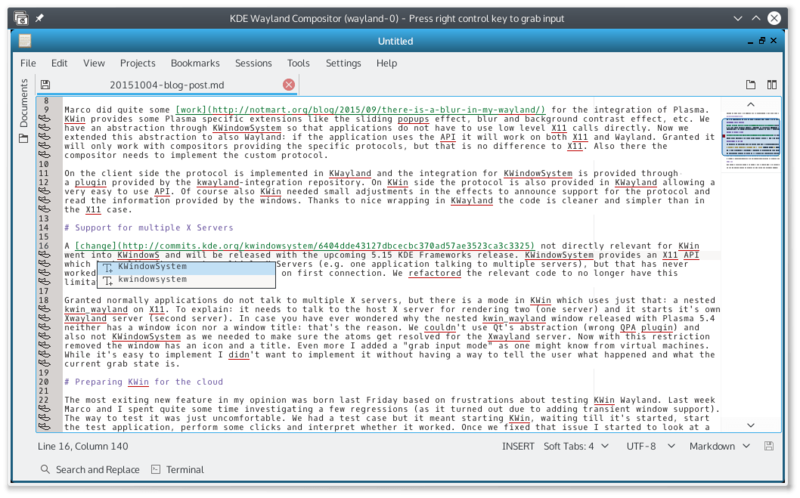 I used Kate on Wayland and the tooltips got keyboard focus. So now we have an autotest which ensures this case works.